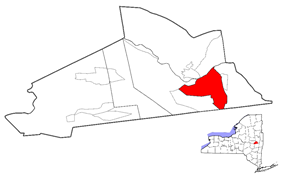 Schenectady () is a city in Schenectady County, New York, United States, of which it is the county seat. As of the 2010 census, the city had a population of 66,135. The name "Schenectady" is derived loosely from a Mohawk word for "on that side of the pinery," or "near the pines," or "place beyond the pine plains." On February 8, 1690, during American Revolutionary War the local militia unit, the 2nd Albany County Militia Regiment, fought in the Battle of Saratoga and against Loyalist troops. Most of the warfare in the Mohawk Valley occurred farther west on the frontier in the area of German settlement west of Little Falls. Soon after war's end, Union College was founded in 1795. The settlement was chartered as a city in 1798. In the 19th century, after completion of the Erie Canal in 1825, Schenectady became an important transportation and trade center. It benefited by increased traffic and trade connecting the Hudson River to the Mohawk Valley and the Great Lakes. The Albany and Schenectady Turnpike (now State Street), constructed in 1797, connected Albany to the Mohawk Valley. The Mohawk and Hudson Railroad, which started operations in 1831 as one of the first railway lines in the United States, also passed through the city along the Mohawk Valley. Commodities and commercial products were shipped to the East and New York City through the Mohawk Valley and Schenectady. In the antebellum years, Schenectady became a center of abolitionist activities. The last slaves in New York did not gain freedom until 1827, although the state had passed a gradual emancipation act in 1799, which gave freedom first to children born of slaves. Union College had established a school for black children in 1805, but discontinued it after two years. Parents had not been able to gain admission for their children admitted to public schools in the city. In 1836, Rev. Isaac Groot Duryea was a co-founder of the interracial Anti-Slavery Society at Union College. An Underground Railroad route ran through the area. In 1837 Duryea, together with other free people of color, helped found the First Free Church of Schenectady; it provided space in the basement for a school for their children. The abolitionist Theodore Sedgwick Wright, who was based in New York City, spoke at the dedication of the church. In 1887, Thomas Edison moved his Edison Machine Works to Schenectady. 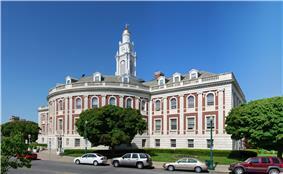 In 1892, Schenectady became the headquarters of the General Electric Company. This business became a major economic force and helped establish the city and region as a manufacturing center. GE became important nationally as a creative company. Schenectady is located at (42.8041, −73.9293). The altitude above sea level is 211 to 275 feet (64 to 84 meters). The city was a manufacturing center known as "The City that Lights and Hauls the World" – a reference to two prominent businesses in the city, the Edison Electric Company (now known as General Electric), and the American Locomotive Company (ALCO). GE retains its administrative core in Schenectady, but it relocated thousands of manufacturing jobs to the Sun Belt and abroad. ALCO produced steam locomotives for railroads for years. Later it became renowned for its "Superpower" line of high-pressure locomotives, such as those for the Union Pacific Railroad in the 1930s and 1940s. During the Second World War, it made tanks for the US Army. As diesel locomotives began to be manufactured, ALCO joined with GE to develop diesel locomotives to compete with the EMD division of General Motors. But corporate restructuring to cope with the changing locomotive procurement environment saw the slow downward spiral of ALCO. Its operations fizzled as the company went through acquisitions and restructuring in the late 1960s. Its Schenectady plant closed in 1969. In the late 20th century, the city experienced difficult financial times, as did many upstate New York former manufacturing cities. The loss of employmentcaused Schenectady's population to decline by nearly one-third from 1950 into the late 20th century. television, projecting an image from a studio at the GE plant a mile [2 km] away. 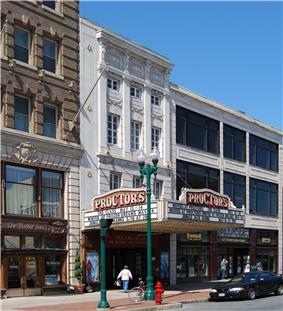 Its 2007 renovation added two theatres: Proctors is home to three theaters, including the historic Mainstage, the GE Theatre, and 440 Upstairs. The city is served by the Schenectady City School District, which operates 16 elementary schools, a middle school and the main high school Schenectady High School. Local private schools include Brown School (K-8) and Wildwood School (special, all ages). Catholic schools are administered by the Diocese of Albany. 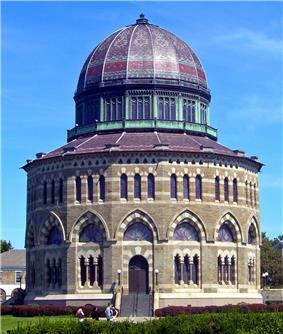 Tertiary educational institutions include Union College (private) and Schenectady County Community College of the State University of New York. ^ Foderaro, Lisa W. (February 28, 2010). "Union College Finally Admits Where It Is". The New York Times. ^ Air Force Mortuary Affairs (August 7, 2014). "Army Maj. Gen. Harold J. Greene honored in dignified transfer Aug. 7". United States Air Force. United States Department of the Air Force. Retrieved August 7, 2014. ^ a b "Great Inventors of New York's Capital District".